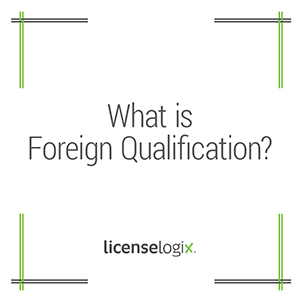 Foreign Qualification is the process of registering your business entity in a state other than the domestic state where the entity was formed. This “foreign state” registration, also called Certificate of Authority or Authorization to Transact Business, is generally required when an entity is regularly transacting business in a new state. These registrations are usually administered by a state agency called the Secretary of State or Department of State. A registered agent located in the new state is usually required. This registration allows the business to legally operate within the state and is often a prerequisite for obtaining licenses in the state. LicenseLogix will obtain all of the licenses and registrations required to operate within a new state, minimizing time-consuming and costly delays. To get a free quote, please can fill in the form on the right or call us at (800) 292-0909.